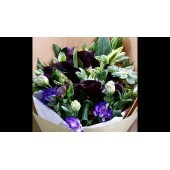 Most flowers given as gifts are cut from the trees or plants. Calla Lily is a flower both cut and used in bouquets and given as a living potted plant gift. The most common meanings of this bloom include resurrection and rebirth, faith and purity. Our flower shop have many brighten color of Calla Lilies, aside from the classic white, we also have brighten yellow, dark purple and pink. Different color have their own meaning: bright yellow for representing joy, growth, and change; dark purple for royalty and strength; pink for admiration and flirting and dark red for passion. Calla lilies make appropriate gifts for many religious holidays, aside from those occasions, consider giving the gift of the flowers for the birth of a new baby or a child’s birthday. 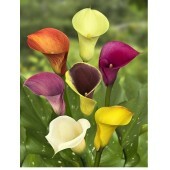 You can also celebrating a loved one’s success at study and work with a bunch of yellow Calla Lilies. 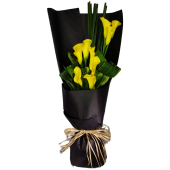 New Zealand Yellow Calla Lily, the different with China Calla lily is the flowers is more big and it..
A Special France Style Bouquet with 10pcs Cally Lily from New Zealand beautifully wrapped in a Dark ..
A bunch of very special Cally Lily in Black Color, Black Color Calla lily Bouquet from New Zealand ..
A Wonderful Calla Lily from New Zealand, 10 pcs Pink Color Cally Lily Bouquet for a wonderful Lady ..